One look at me and people jump to implausible conclusions. They say he’s born to live in Beverly Hills, (an admittedly favored city to San Francisco’s distinguished culinary but yuppy vibe). Or that he runs on New York Fashion Week marathons, not treadmills or boxing classes that he Instagrams so frequently. Or that his recent exodus to Milan was a farewell to leaving footsteps in the sand, for he would thereafter only be seen in clouds. Sorry folks, I am as real as it gets. And reality is all about juxtaposition. 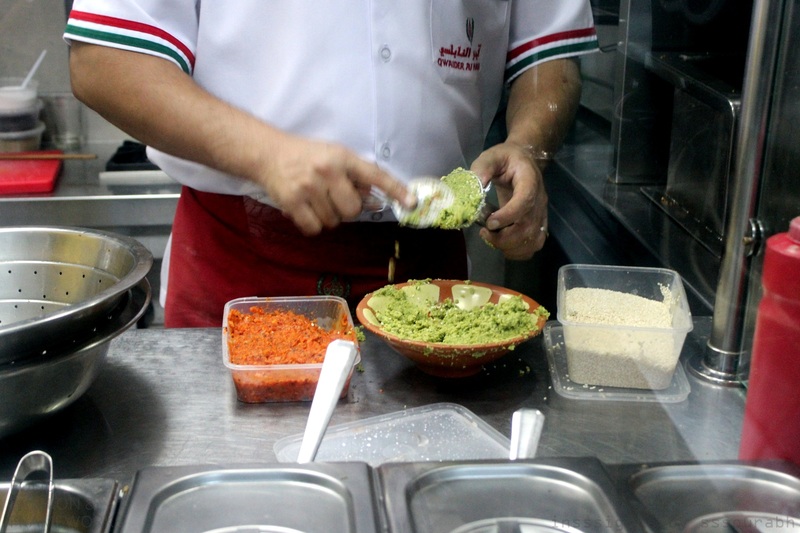 Which is why, when I say I like visiting Dubai, it isn’t because of tall towers or populous malls, or its culinary fiesta which boasts of exotic menus for which ingredients have to travel from faraway lands and are stored in surprisingly dry desert climates. Nor is it because I visually blend in with Canon clad voyagers who give off whiffs of Versace and Chanel, for in retrospect, they are almost held captive in a metropolis that is akin to Dorothy’s plunge into a poppy field. It is in fact because I enjoy inhaling authenticity of any sort. Especially when a glamorous host lyrically recites the history of culinary Arabia in a way that juxtaposes a well knowledged prestigious guest lecturer and a beauty queen after her year of reigning the world. I speak of the inspiration to my own blogverse and the one who guided me into the world’s food scene by opening the doors with an unsuspecting double dessert meal at Chili’s Grill and Bar on a chilly, spring evening. I Live in a Frying Pan’s whimsical founder, Arva. For little did we know, upon bouncing onto Philadelphia’s sketchy streets that evening, a saga was set sail which would conquer the food world with passionate taste buds. Despite having drifted into two separate oceans (Arabic and Atlantic, respectively), the saga still lives to tell tales. And this tale is one crowning jewel. I met Arva in her Philadelphia days, when discovering new ways to consume caffeine on an hourly basis or the burden of finishing homework and reading ahead for class were far more superior priorities than what morsels to stick into parched college mouths. Half a decade later she immersed herself in the New York world, raising a marathon toned arm out of the waters of corporate to consume infrequent mouthfuls and decadence, thankfully often with yours truly. 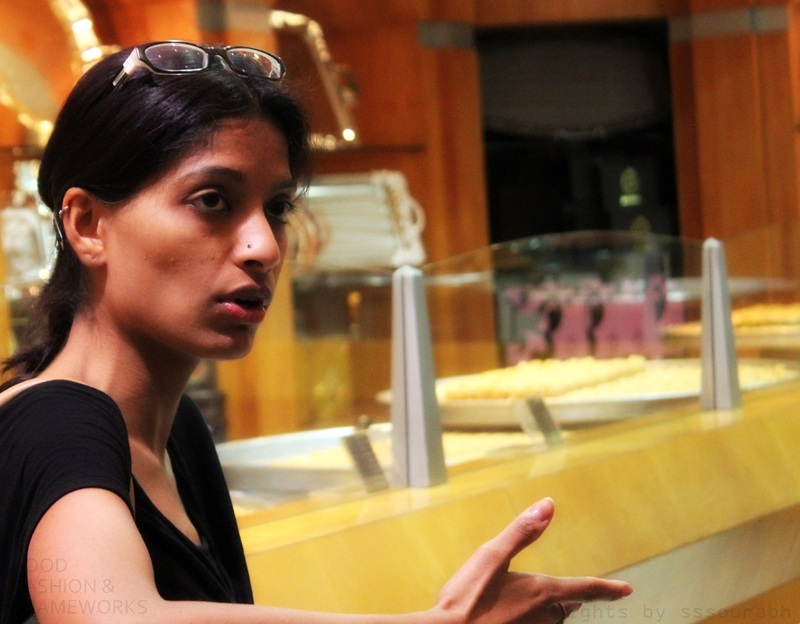 After a somber farewell to Dubai, my visits unearthed a lady I was rather unfamiliar with, one who wasn’t zealously poised for success but rather genuinely passionate about her city. And she did not chase the slick gelled Mohawks, the towering spas in bizarre skyscrapers, the studs in Ferraris with petite lions as pets, the lipstick dipped damsels in fake tans, the artificial snowmen besides seven star pre-fixed Michelins, or anything synonymous with the wealth of this golden desert. She instead forayed into a Dubai that I too had childhood memories of. Where buildings were a few stories high, surrounded by humble allies selling aromatic spices and plastic wrapped foods and gifts, and where culture stood deep rooted, unplucked and unnoticed in the shadows of towering dart shaped structures. 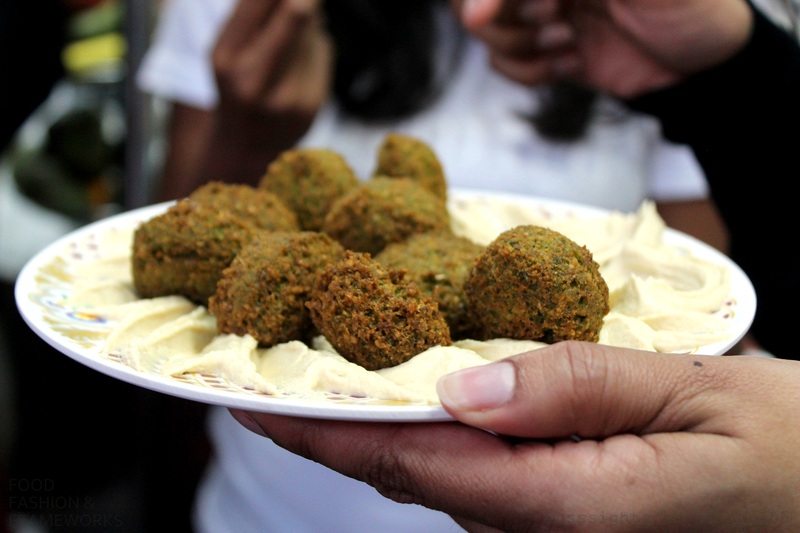 And thus, when Arva painted her food dream onto a canvas on Dubai’s Deira creek, rescuing tourists trapped in mazes called malls and posing near Egyptian pharaohs with a travel identity crisis, I had to join her Frying Pan Food Tours. 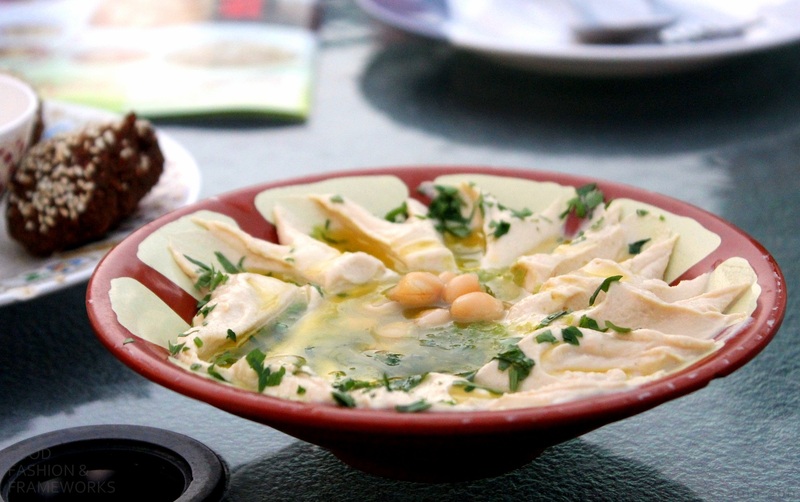 Exploring unearthed, secret hideouts of culinary jewels, this was an evening worth of travels along the crescent of the coast, from Iran to Yemen to Egypt to Lebanon to Jordan. 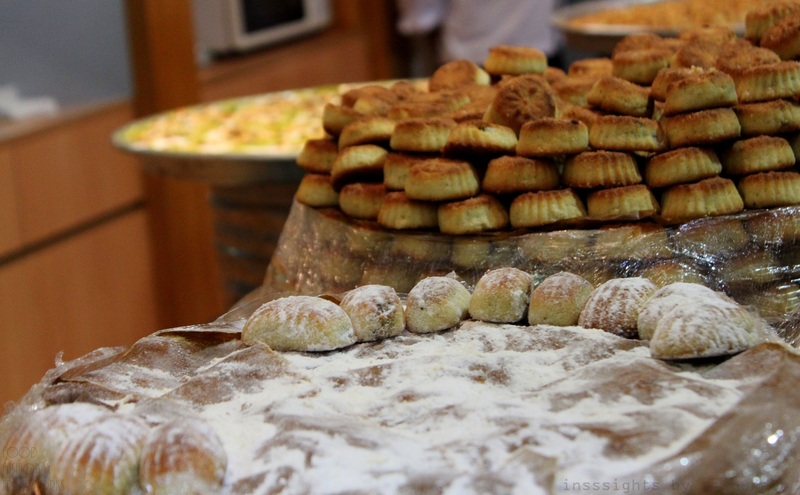 Behold the culinary edition of Arabian Nights, the way they should be. 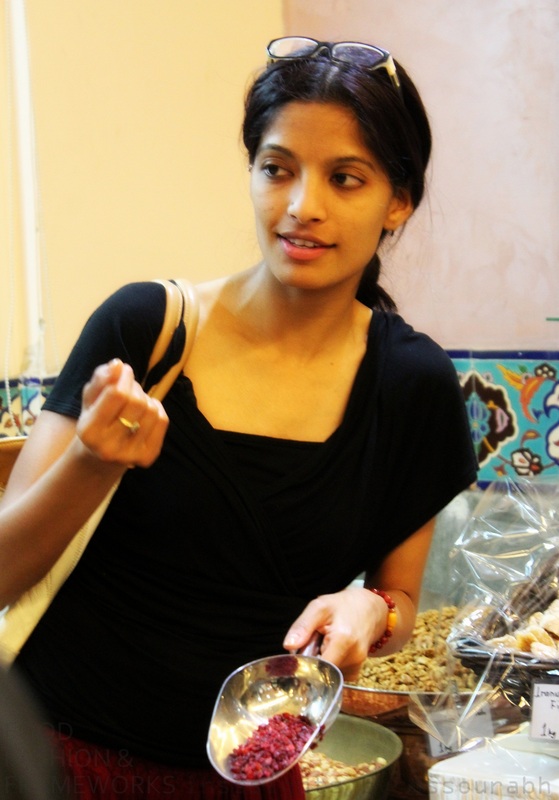 Starting at Sultan Dubai Falafel on a surprisingly chilly Dubai evening, Arva stood poised in her trending harem pants looking glamorously runway ready in a petite stature that made more than one of the eager foodies wonder if our host actually ate anything herself! 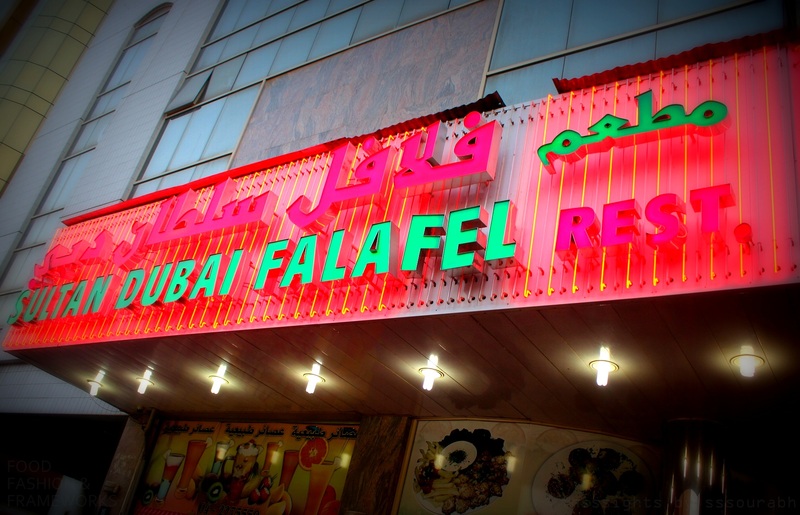 Perched under the kitsch 90s pink and green neon sign with an omenic falling ‘F’, we got a tutorial on falafel making that instinctively reminded me of Punjabi street food. 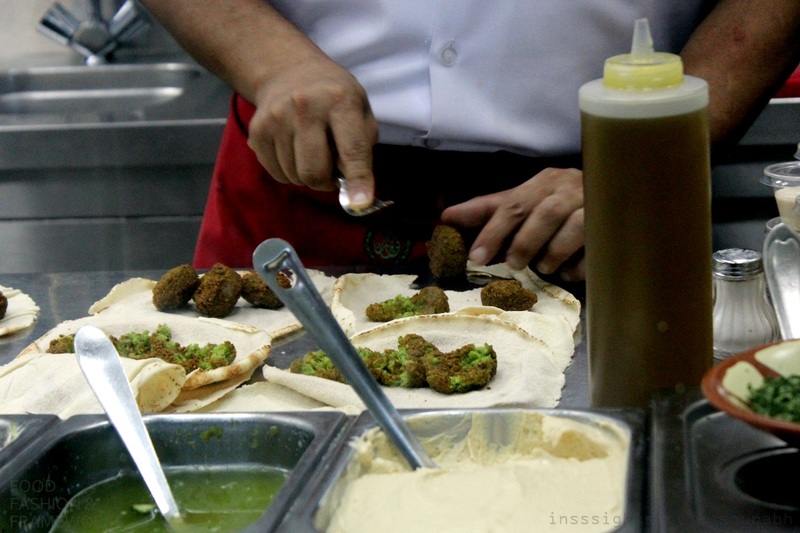 The surprise was the falafel mashi, stuffed with chickpeas (think chole in bhajia, people! 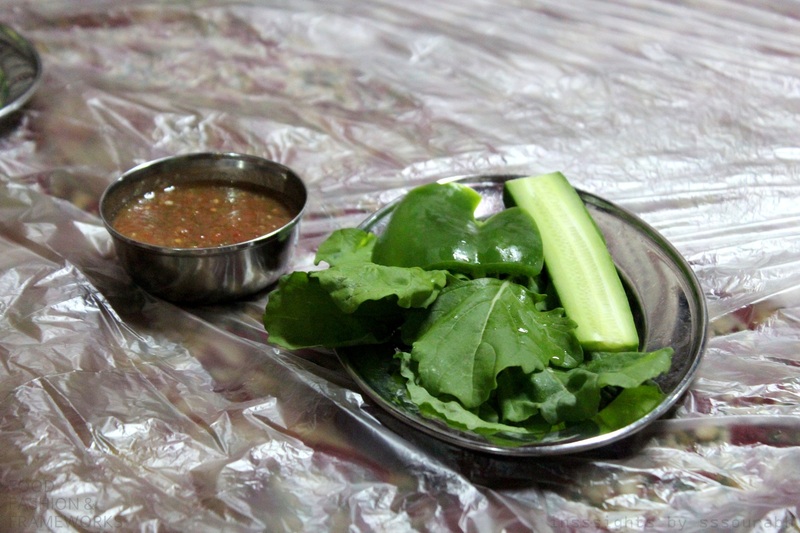 ), onion and a hint of a feisty red chili and regional spices. 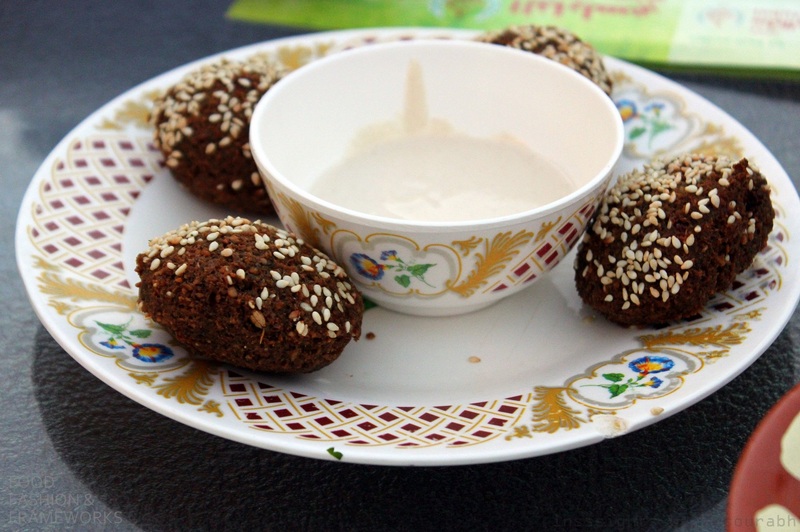 The crunch factor was acquired by frying it with sesame seeds, served with ground sesame yogurt dip and hummus of chickpeas. Talk about multi-purposing ingredients into different formats, like asking for fish as bait for fish. And how it worked! So dental testing-ly crunchy on the outside and meltingly soft on the inside, washing away memories of disastrous rip-offs in the Financial District of faraway shores. Shores where a falling ‘F’ would’ve made for a fail, but in the luscious streets of discovering Deira, it was merely shrugged off amidst the ‘F’ for fun! 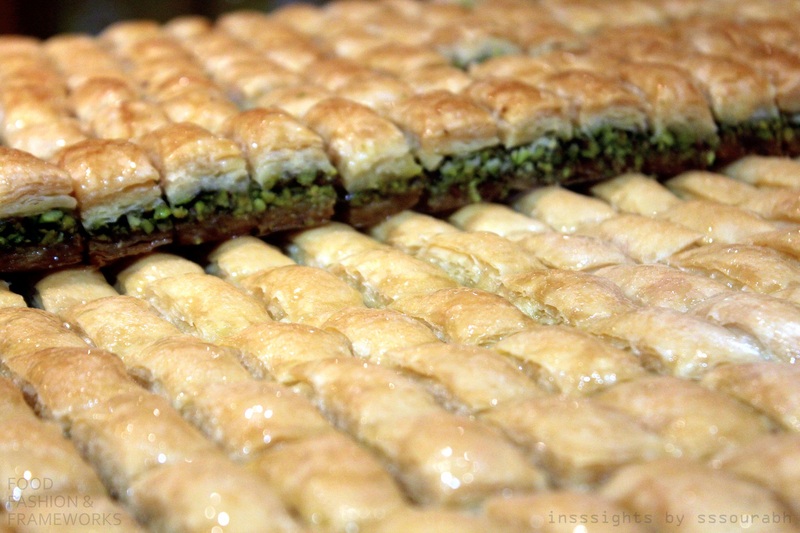 I mean seriously, the only things missing from Al Samadi Sweets were angelic, doe eyed angels with wings, picking up the golden hues that reflected off of a plethora of baklava treats and transforming them into pixie dust. 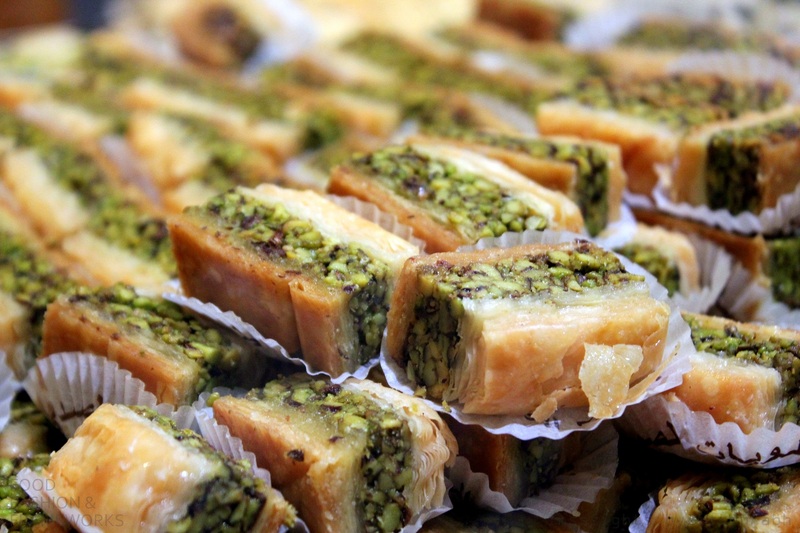 Having been gifted Al Samadi Baklava time and time again from Arva, and even scouted a close competitor in the unlikely city of Rotterdam, the arrival to the actual premise was nothing short of utopia. So much so that I promise to dedicate a separate review to this haven itself, for I have proudly tried virtually everything it has to offer! 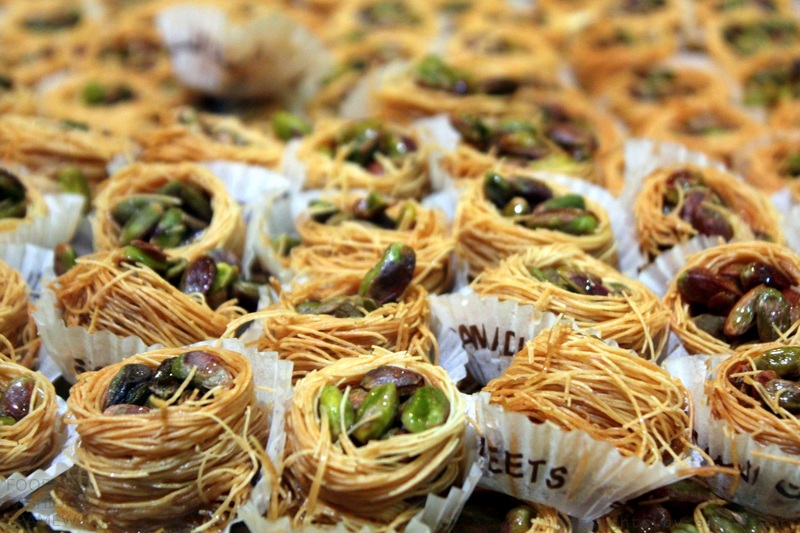 The baklava was classically Turkish: phyllo dough crunched up and stuffed with walnuts and sugar with a hint of honey maple, while an angel’s nest rendition showcased how phyllo could be aped into noodle-like strands that were held together with sugar syrup, with their cavity drenched in green and purple pistachios. I learned that its name was rather reminiscent of a love story or a chirping bird: Bulbul Yuvasi. 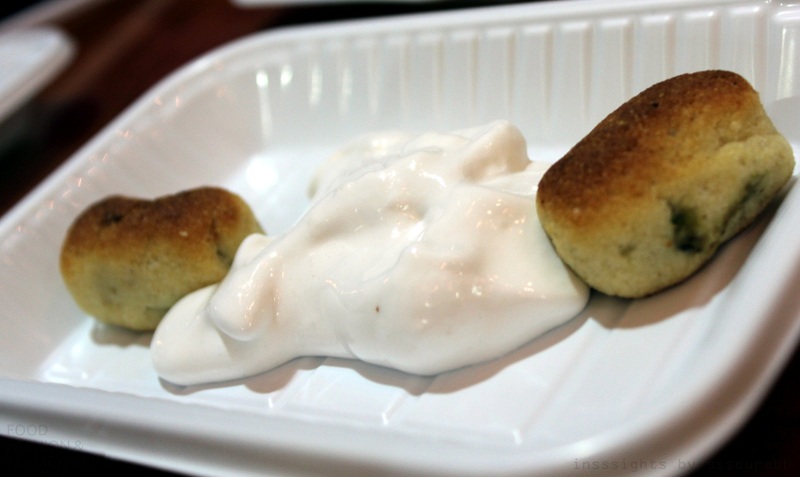 Arva insisted on us trying a Lebanese cookie called Karabij, looking rather like a cutlet and sour cream snack. 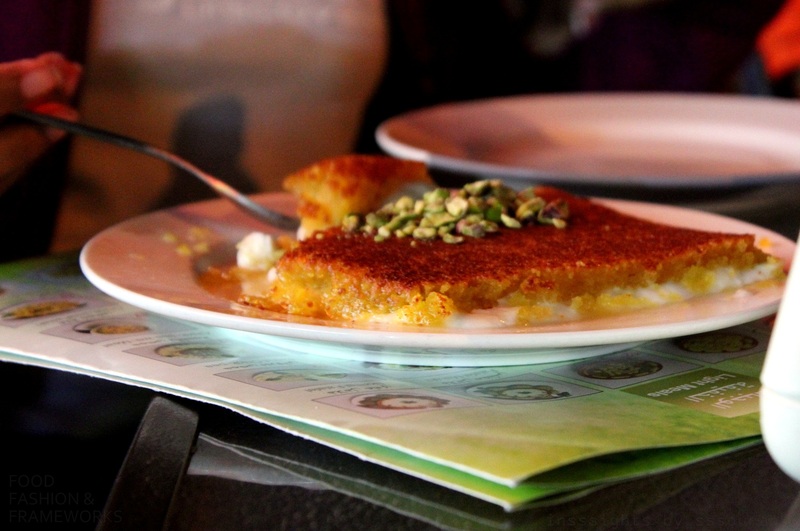 It was instead a cookie stuffed with pistachios, with the texture of halwa, served with a bitter natef cream, made from a ground root and doused with pistachio shavings. 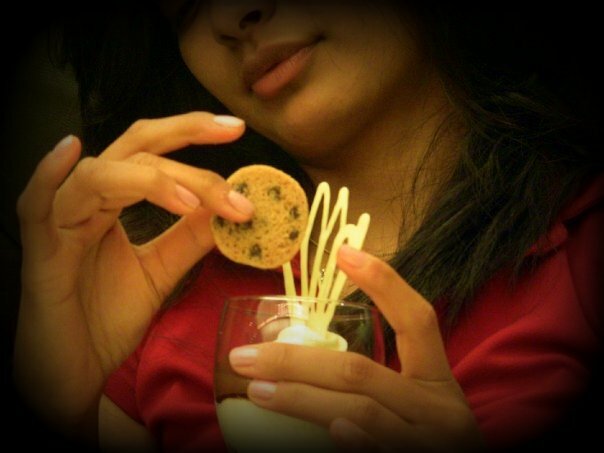 The combination was intriguing, for the slickness of the cookie contrasted comically with the bitterness of the meringue like cream, woven together with pistachio flakes that seemed to have lost their crunch, falling asleep on the natef’s pillowy texture. 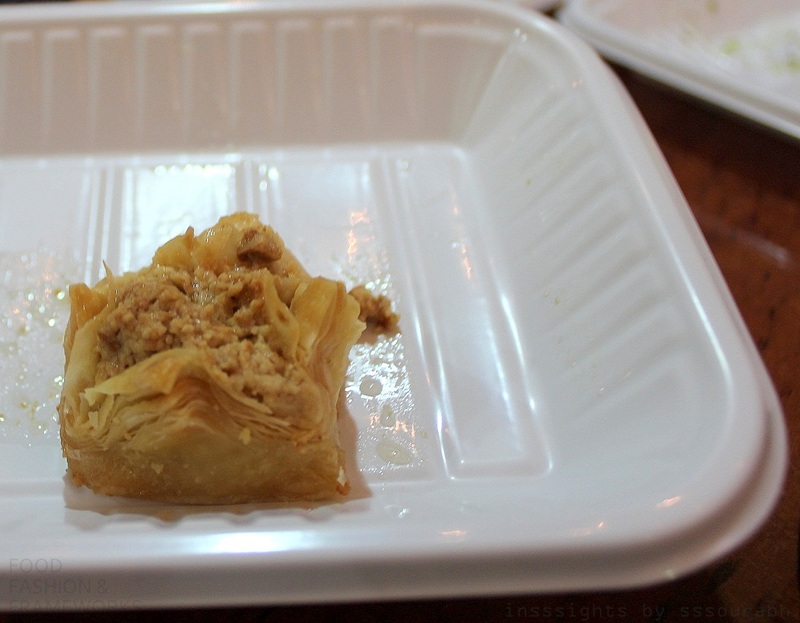 As I inched towards the mountains of baklava in hopes of going for a hike, for some indeed looked like treasure chests that belonged in Tolkien’s Hobbit episodic, Arva whisked us aside to try the Halawat al Jibn. Shaped like a cannelloni but made of Semolina and cheese, and stuffed with a rose flavored custard, the entire concoction was drowned in sugar syrup and topped with punchy red and pistachio green finery. 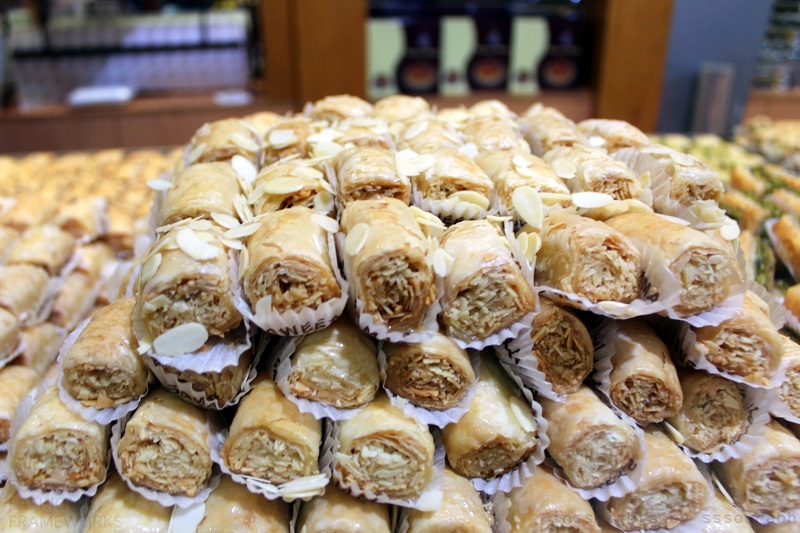 The colors of Christmas, and the tastes of Lebanon. Truly, the world was a tiny, tiny place. I’ve never really liked pizzas, except perhaps a dessert pizza or a well done deep dish from ethereal Chicago or from Berlin’s flagship Vapiano. And rightfully so, because perhaps I had one day dreamed of opening the quintessential pizza box to find something alluring that said “Eat Me” more convincingly than Alice’s potion. 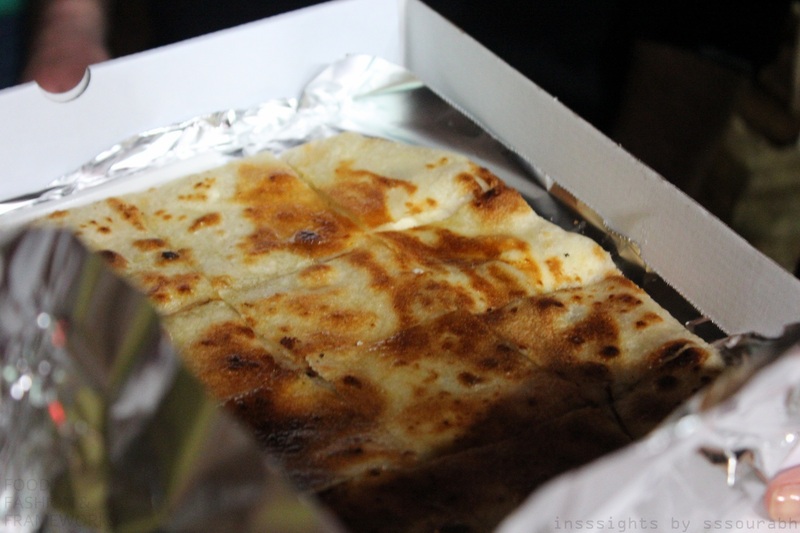 The cheese fateer was truly the answer, Egypt’s very own pie-pizza fusion, formed of layered pastry doughs and stuffed with cheese (or meats, or dessertified with honey and nuts). 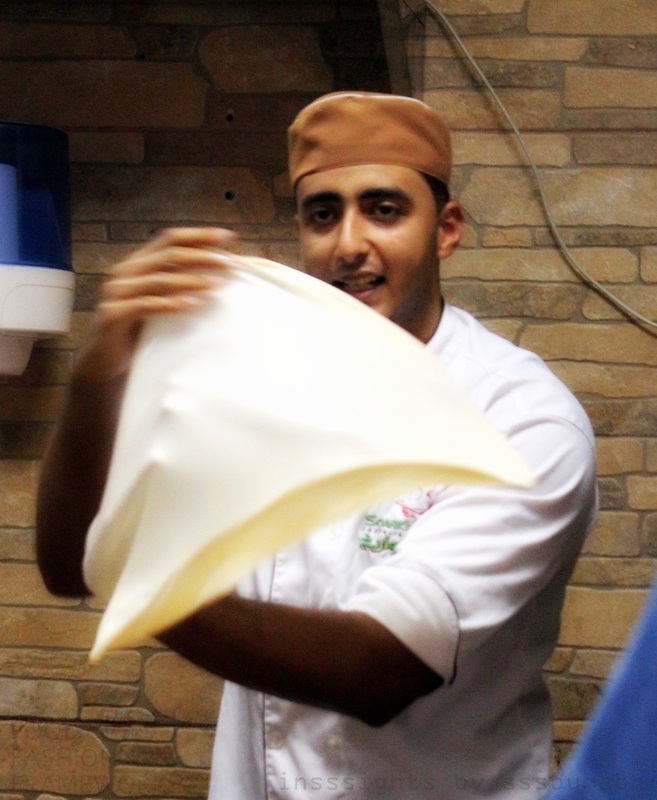 The demonstration of making the dough at Soarikh Restaurant was dazzling, with a chef in a crisply white uniform and beige Abu hat showcasing the magic of throwing the circling dough in the air and catching and spinning it like an acrobatic damsel, retaining the shape and evenness in texture throughout. What was more comical was the line of Kraft cheese in its Arabic variety stacked in mason jars behind him, showcasing the simplicity of the culinary world that is so often overlooked in haute cuisine. Crisped golden brown and served in a pizza box (touché! ), it was exactly what you wanted it to taste like: crispy but not greasy on its thin surface, and meltingly cheesy on the inside. And yes, I had found a Kraft cheese product to love. 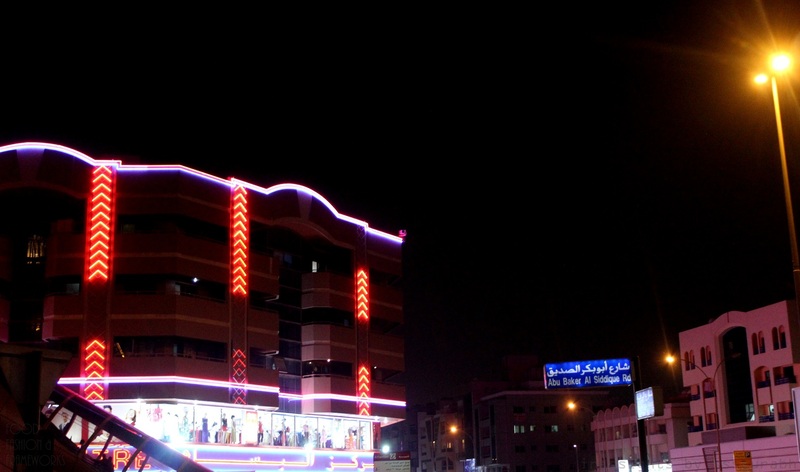 The waltz towards the next destination allowed us to see mosques, street signs, and a general calm in the staple neon lights of this part of the city, a far cry from the frozen structures of Dubai’s towering, gleaming skyline. 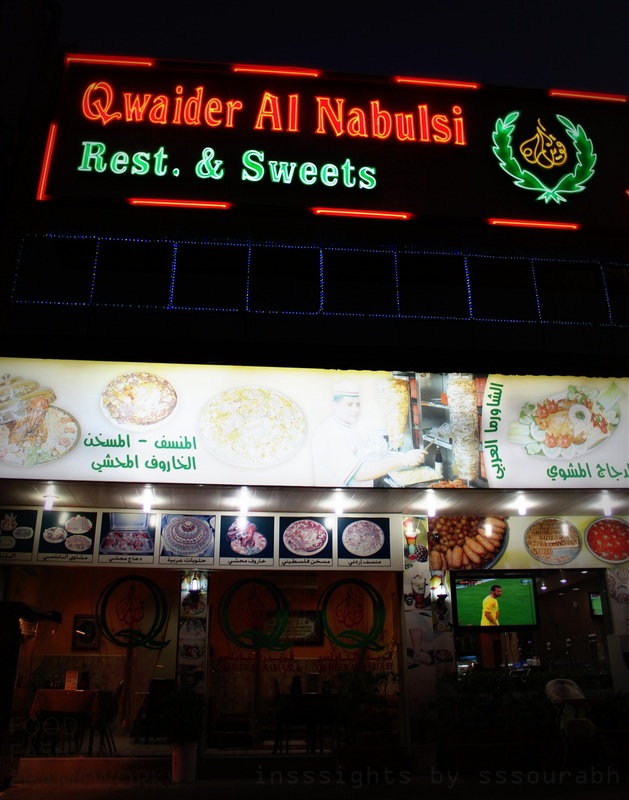 Arva warned me that the next part was going to be meat heavy at Al Tawasol Restaurant of Yemen. The place had a quirky take on indoor privacy, with Bedouin carpets and plastic covering the floor where we sat on comfortable red cushions encased in Bohemian printed tents under dim, blue tube light that whisked me right back to Tanzania. We were guided on how to eat chicken and saffron rice with our hands, a practice which was traditional in Yemen courtesy of saving plates to prevent washing and cleaning. Logic, really! One dip of the fresh greens into an alarmingly spicy red tomato sauce must have knocked my food coma self into a snooze fest, for neither do I recall the rest, nor do I have visual memory of the happenings. Dreaming of a golden Jasmine or an oil soaked dessert, I must have simply tranced through till the next venue. 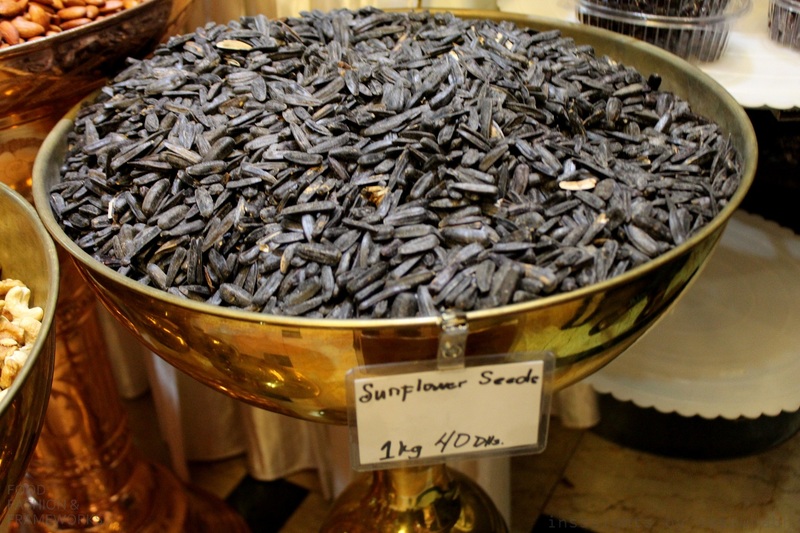 A detour into an Arabic spice shop was an authentic Dubai shopping experience – unlike getting lost in Dubai Mall amongst retailers that I could easily find in London and New York. The shelves were swarming with replicating tin and plastic packages on walls, with neon flicker lights sparkling across shelves, not adding much to the visual perspective, but probably just kept as a tired facet of habit. 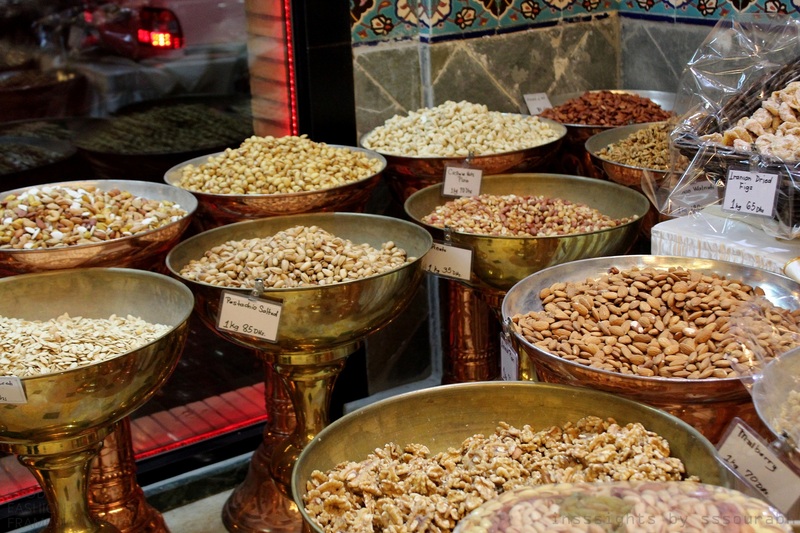 The floors looked like they had been the inspiration for Aladdin, swamped with golden cauldrons of the largest variety of nuts I had seen. The air was scented with a blend of nuttiness and aromatic spices. 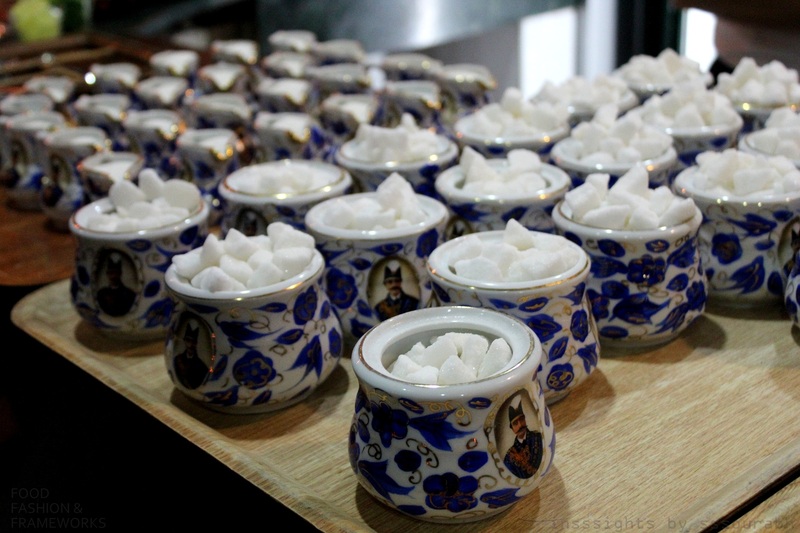 My eyes darted from spectacle to spectacle, inhaling nutty varieties, raw or sugar glazed into decorative platters. Many new additives came to light, in quirky shapes like Roman miniature pillars, or in unseen abundances like sunflower seeds. 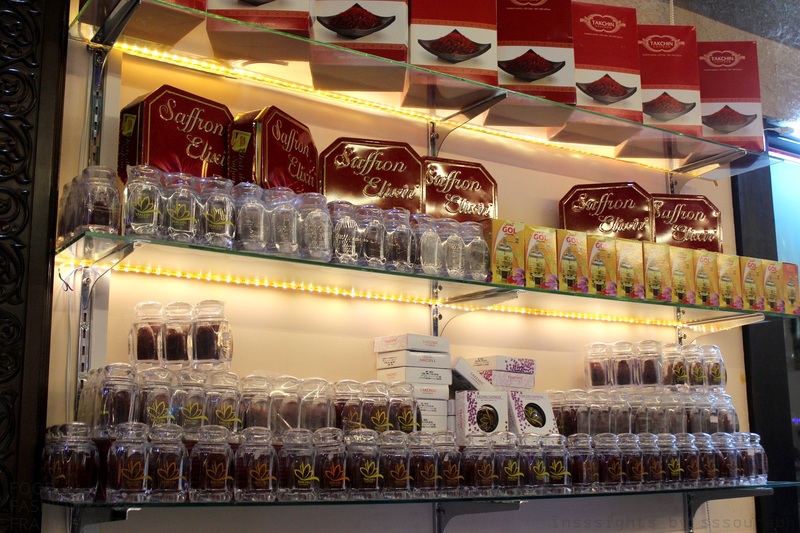 I was drawn towards the varieties of saffron, a favorite, aromatic and sensual sprinkle to a plethora of dishes. 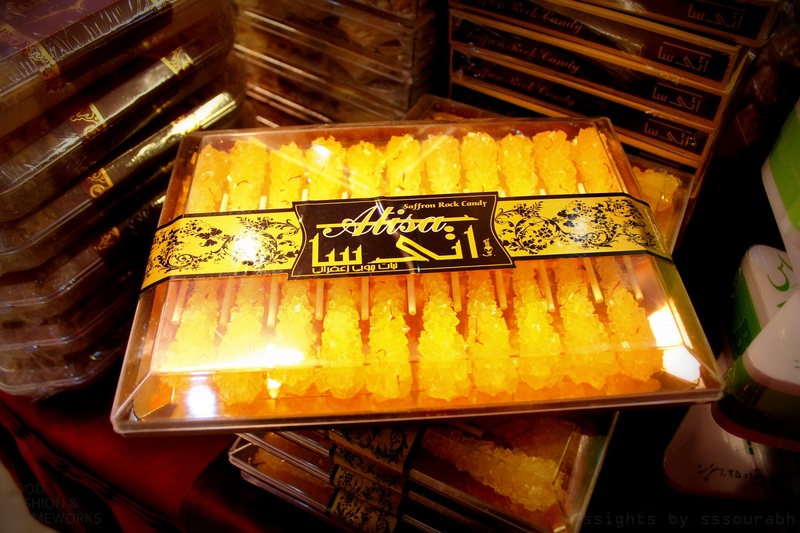 Beyond learning of saffron’s quality distinguishers (yellow tail) and eying saffron elixirs lined on shelves, I jumped in glee at seeing saffron rock candy. The marriage of my candy loving childhood and adult palette. The last stop on this crescent ride was Abshar, an Iranian restaurant unlike any that I had been to, for it was atop a nameless mall, where I would encounter a self realization. Decorated with the same red-carpet-under-blue-tube-light hues, the highlight was the rather loud Iranian folk singers churning out hoity songs that evoked random claps from a cheery audience, comfortable in the clean and kitsch cushiony ambiance. 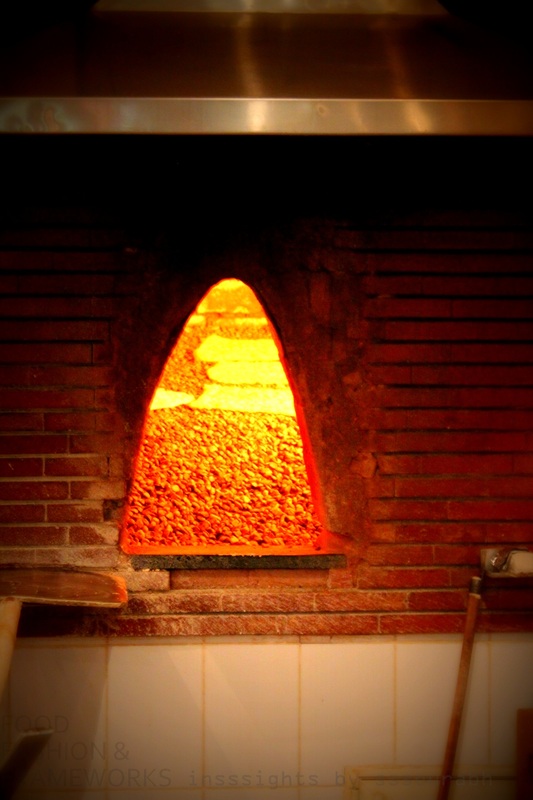 A walk into the kitchen revealed a roaring fire through the peak of window, which held bread on wooden planks. The ethereally scented bread emerged steaming, baked, and sliced almost instantly to be served with sauces and stews garnished with walnuts and sultanas. 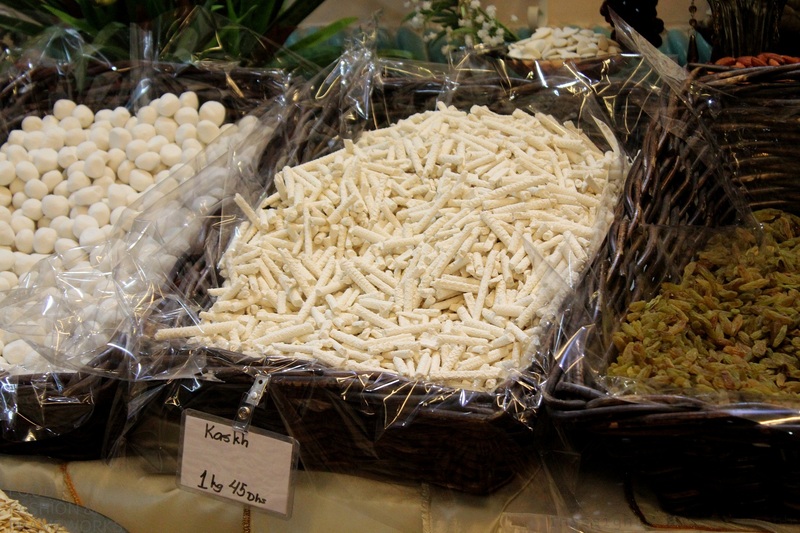 Skipping over traditional Iranian kebabs, I dived straight into the sugar. I rubbed my eyes as I saw a geometric twin of my favorite gulab jamun, a golden brown dough pastry drenched in sugar syrup with honey. 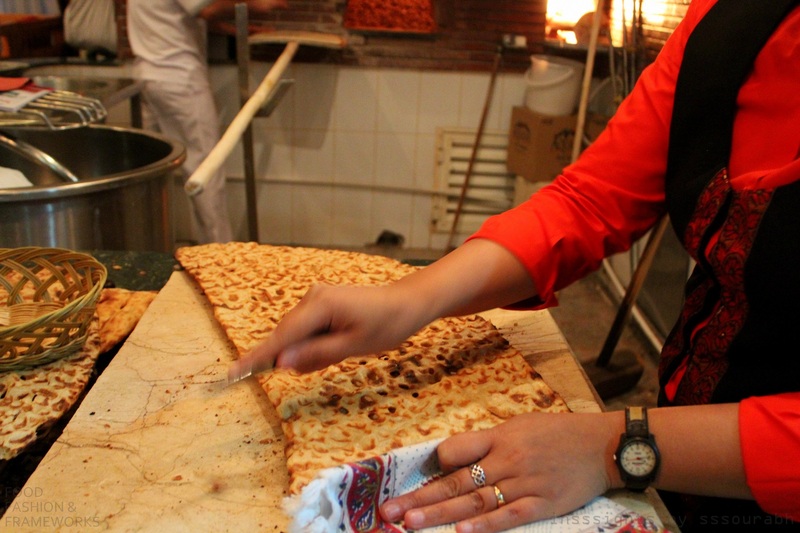 The Iranian version had a crispier exterior, and had a dose of cinnamon and rosewater essence to ground it to tradition. 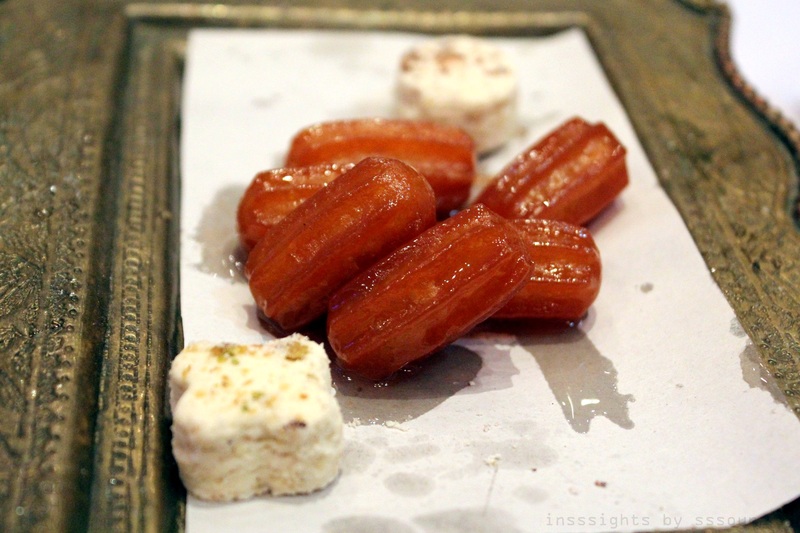 A terrific long lost love to my Punjabi rooted gulab jamun, the first of two things to make me wonder of my Iranian connection. 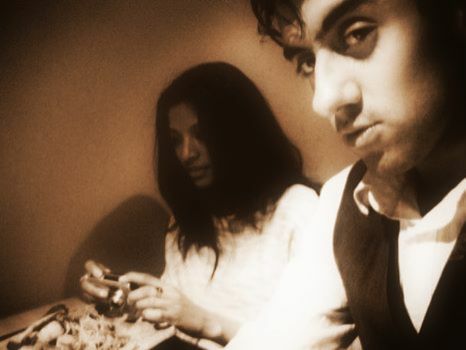 And the night ended with Iranian tea, a trending accompaniment to any meal. 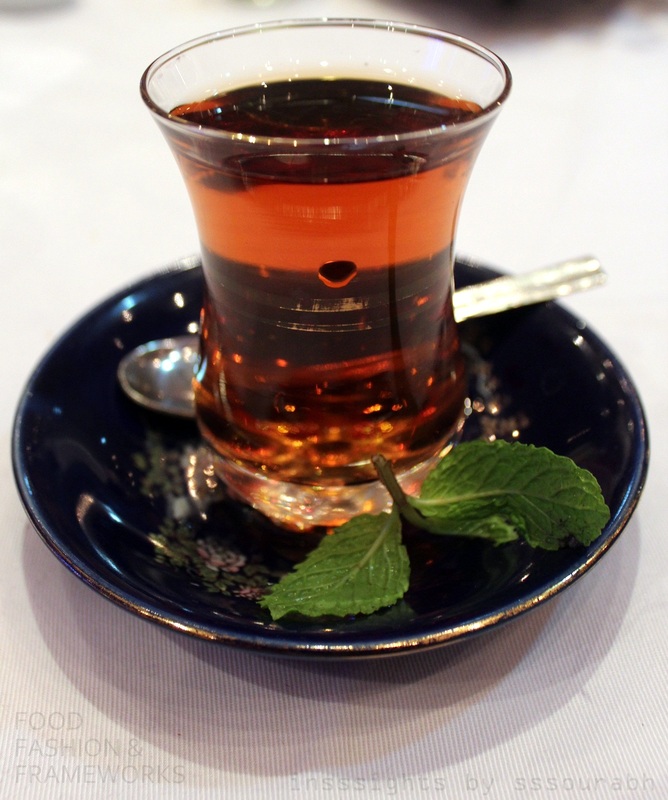 I was told it was traditionally sipped after every meal and throughout the day in Iran, making me wonder if my ancestors actually were from Iran: for not only am I a tea addict, but yours truly has also been mistaken for Persian too many times for coincidence. 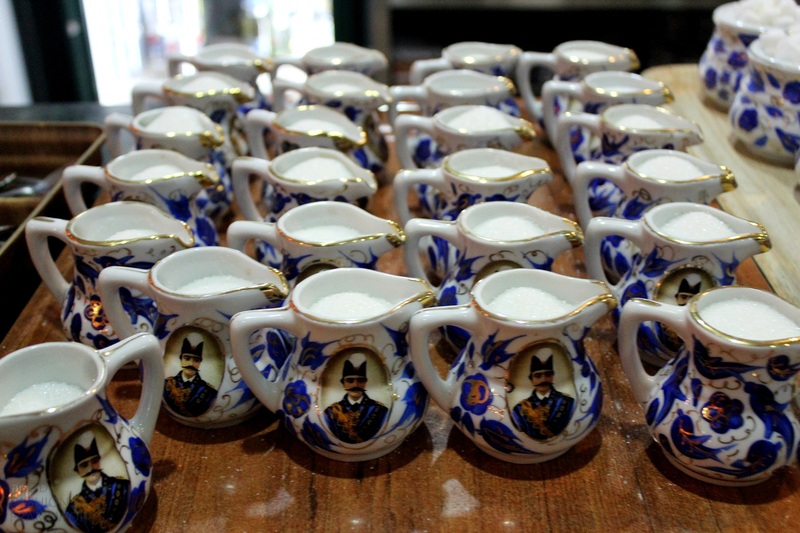 The tea was an aromatic, rose hinted green leaf tea, served with Delft blue porcelain pitchers of whole milk and sugar, none of which I took but couldn’t help but fall romantically in love with. For the set up reignited the nostalgia of how tea should be sipped, an elegance commoditized by the fast, faster, fastest cultures of the digital age. 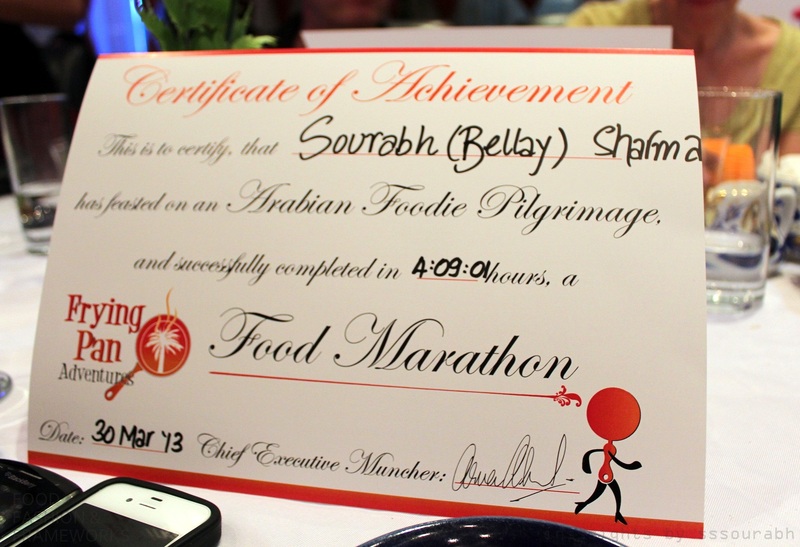 Saturated in flavor and overwhelmed with newfound history and knowledge on a passionate topic of food, a completion certificate legitimized my learning and made this an Arabian Night to remember, under a crescent moon, like a crown to my experiences in the Middle East. 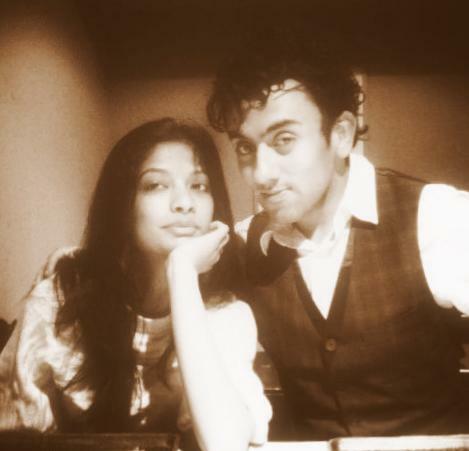 And a feather in the cap for a relationship with the most passionate woman I’ve ever known.